Fire Safe Santa Cruz County is currently seeking grant funding for chipping services and educational events that will help neighborhoods and individual homeowners make their properties more fire safe. Please leave us your contact information and a detailed description of your project and/or your neighborhood's needs on the form below and we will contact you when funding becomes available. Please be aware that chipping old, dry, hard redwood & manzanita branches rapidly wears out a chipper, so contractors will not chip old, dry materials. It is best to do your clearing within 90, or even better, 60 days of when it will be chipped. Old, dry materials are best burned on site in season (December 1 to April 30), or hauled away privately to a landfill that accepts green waste. Create 30’-100’ of defensible space around buildings and 20’ on either side of roads by clearing brush and thinning trees. Click here for more guidance on creating defensible space. Place brush piles in an accessible location adjacent to a driveway, road, or street on the uphill side and close to a turn-around area. Do not place piles along busy roadways where traffic safety crews would be necessary as additional crews are not covered under our contract. Piles placed in fields will not be chipped. 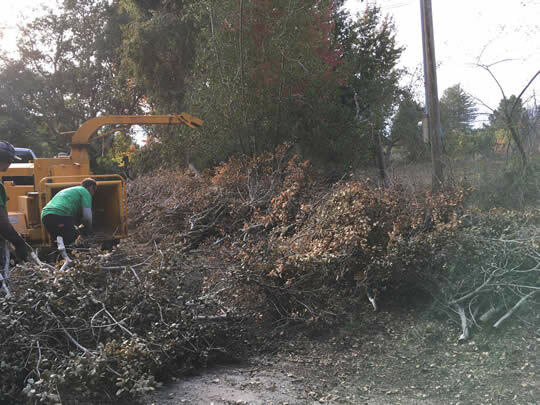 Ensure that your brush piles are wide and spread out rather than stacked high and that all cut ends are facing the road from which the chipper will access the pile. Piles must be free of wire, rocks, dirt, lumber, blackberry cuttings, broom with seeds, other spiny plants, and poison oak. Make sure piles consist of freshly cut brush with branches no larger than 7” in diameter. It is best to chip freshly cut vegetation. Root balls, rakings, dried out vegetation, and decayed wood cause problems with the chipper. Keep track of the amount of time you spend cutting and stacking material for chipping. This information is important in helping us obtain future funding. Please be as accurate as possible. Note: Fire Safe contractors do not operate equipment on National Weather Service RED FLAG warning days. If you have a site visit scheduled on a RED FLAG day, you will be rescheduled for chipping. All chipping visits will be limited to one 8-hour shift per parcel.